R v. Keegstra: What Scanlon says about Freedom of Speech in Canada? Recently, the court in the US held that clicking “like” on social media is part of free speech. Majority believes that this is the correct decision, and freedom of speech has been discussed in different contexts depending on how individuals look at it. Philosophers have always had different views about freedom of speech. In this blog post, I am going to summarize T.M. Scanlon’s idea on freedom of speech which is heavily influenced by the idea of contractualism. An act is wrong if its performance under the circumstances would be disallowed by any set of principles for the general regulation of behaviour that no one could reasonably reject as a basis for informed, unforced, general agreement. The idea of contractualism nevertheless is highly adopted to his idea of freedom of expression. Scanlon believes that there is a tension between the value of freedom of speech and the undersirability of people to express misleading views. Accordingly, people must be given the freedom to express themselves as long as they do not express misleading views. Scanlon believe that an open society is the key to development because citizens have an opportunity to participate in nation building without fear of intimidation. He emphasizes the value of an open society and believes that a state that does not allow its citizens to object some of its activities cannot claim to promote legitimate political institutions. In his view, the legitimacy of a political institution is defined by the ability of citizens to express their views. He also believes that one cannot talk about freedom of expression without mentioning autonomy. 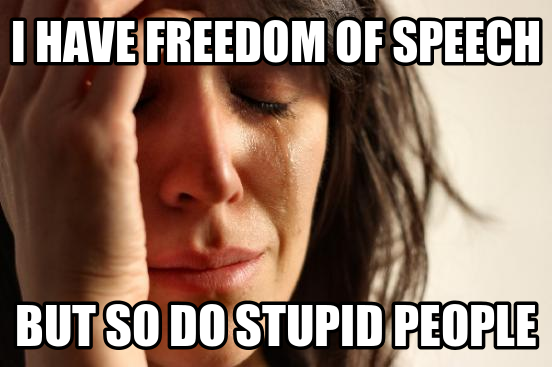 According to Scanlon, freedom of speech has its legitimate restrictions that need to be acknowledged. He argues that it is legitimate to deny conspirators, false advertisers and those who may be involved in carrying out dangerous presentations or idea. Scanlon believes that freedom of speech has intrinsic value because it is important that individuals as autonomous, whether or not this results in good consequences. Scanlon’s position does not imply that being able to express oneself freely is valuable as a means to the end, or it is a goal of being autonomous. Rather, it is simply to express that being able to express oneself freely is part of what it means to be autonomous. Since autonomy has an intrinsically valuable, freedom of expression is also intrinsically valuable. Scanlon also provides six example of harmful speech. He believes all these examples are legitimate to prohibit in order to prevent any kind of harm. Expression which causes individual’s panic, for example, in the case Schenck v. United States (1919), a person shouted “fire!” in a crowded theater when there was no fire. His speech caused individual’s panic. expression which provides means rather than reasons. Scanlon believes that the tolerating advocacy of views is the price we should be willing to pay if we want to have an open society. Government should be more neutral and objective when it comes to curtailing false advertising compared to political views. He believes that a government that claims to promote an open society should allow citizens to express their political views freely. So, should clicking “like” on social media be regulated? In Scanlon’s perspective, this case could not be regulated because the employees who got fired did not have any expression that caused harm to their employer. Clicking “like” button indeed was a way to express certain idea or opinion. The employer could argue that the employee’s expression was a way to interference with right to fair. However, the appeal court panel seemed to adopt Scanlon’s view in the way that “liking a political candidate’s campaign page communicates the user’s approval of the candidate and supports the campaign by associating the user with it. In this way, it is the Internet equivalent of displaying a political sign in one’s front yard, which the Supreme Court has held is substantive speech.” Thus, the employees’ action cannot cause any harm to their employer because the employer should expect the criticism or rejection from the public including his or her employees. Yet, this court decision does not mean that it will protect every action on social media. If someone clicks “like” button which causes harm to others, such as supporting cyber-bullying, death threat, and hate speech, the law will regulate such action.